Support OH1 optical heart rate sensor Maintenance How do I reset my Polar OH1? How do I reset my Polar OH1? Place the OH1 sensor into the USB adapter with the lens facing up so that the contacts on the sensor and USB adapter meet. Click (Settings) and FACTORY RESET. It takes a moment to the restore factory settings. Unplug the USB adapter from the computer, and then plug it back in again. Once the Flow web service landing page opens, select Sign in and use your existing credentials to log in. Factory reset disconnects OH1 from your user account and deletes all data on the device. All data that you have synced from OH1 to your Flow account is safe. 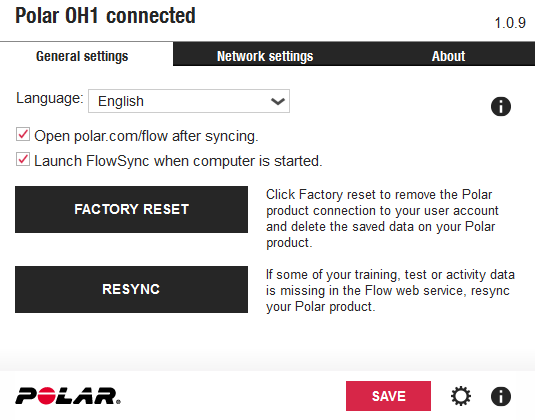 Polar GlobalSupportHow do I reset my Polar OH1?